Caterers share their most popular appetizers and entrees. Your wedding will (most likely) be the biggest dinner party you will ever plan. The goal is to compile a menu all of your mutual friends and family will love, but with possibly more than 100 people from different cultural backgrounds, that’s a daunting task. The best thing to do is enlist the expertise of a seasoned caterer. The top picks are sometimes booked up to a year in advance; so as soon as you know your wedding date, do some research, go for a free tasting and book your caterer. It’s also important to remember that your venue may dictate the style of serving or style of food. What’s possible and appropriate on a beach might not be appropriate in a ballroom. Once you’ve taken all these issues into account, are there any surefire dishes that couples can rely on? Who are the bankable stars of the buffet? We spoke to some of the most experienced caterers in the city and the good news is yes, crowd-pleasers do exist. “Eyes always dart toward us when we come out with favorites such as fried shrimp and crawfish croquettes served with roasted garlic and balsamic aioli,” says Hayley Mitchell, the director of catering at Michael’s Catering. 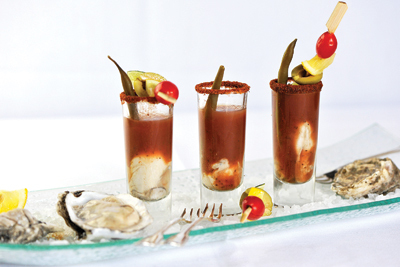 “Oyster shooters are also fun. Fresh Louisiana oysters are enhanced with a bloody Mary sauce spiked with vodka.” Kristen Casey, the director of sales at Messina’s Catering, agrees that easy-to-eat appetizers always do well. “Our one-bite hors d’oeuvres such as shrimp remoulade shooters, seared ahi tuna atop fried wonton with mango salsa and ‘chisei’ ham biscuit slides never fail to impress,” Casey says. Melissa Araujo, the executive chef at Saveur Catering says “easy and elegant always wins out” like the company’s “brochettes with oysters and bacon or our ‘Cabildo’ of lump crab, green onion wrapped in an artichoke leaf with lemon and truffle oil.” “Hand crafted cheese and meat boards also wow,” Araujo adds. Live action stations are also a crowd-pleaser. “A grits bar with local favorites such as rendered Andouille sausage, BBQ Gulf Shrimp and veal grillades, is guaranteed to go down well,” Casey says. After every last crumb of the entree is cleaned up, it’s time for dessert – and a wedding cake isn’t your only option. “When it comes to desserts, people are straying away from the traditional groom’s and bridal cakes and moving towards smaller bites,” Mitchell says. Mitchell has found that petite beignets dusted with sugar are very popular, as well as other less traditional desserts like fruit tarts. Remember the other half of the food decision is how you serve it, whether you want your dinner plated or buffet-style. Your choice will impact the ambience of your wedding as well as your budget, so once again, ask your caterer for the perfect match. The rehearsal dinner and the wedding reception may seem like two parties in a row, but they should be distinctively different. In her famous wedding etiquette guide, Emily Post says the pre-wedding feast is for “the two families to relax and enjoy” and is a “joining of the two families.” New Orleans has a lot of spots to choose from for your party, whether your families love seafood, Creole cuisine or everything on the menu. Deanie’s Seafood offers Southern hospitality and stacks of some of the most acclaimed seafood in town. The French Quarter location is situated near Bourbon Street, and has two upscale private dining options that open on to a classic French Quarter courtyard. There’s also a Bucktown location if you don’t feel like dealing with French Quarter crowds. 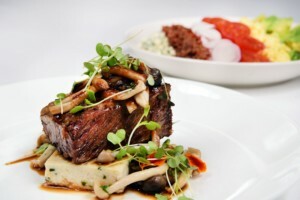 Guests will love a taste of culinary history with dinner at Emeril’s. The menu features Emeril Lagasse’s most famous dishes such as BBQ shrimp, Andouille crusted redfish and banana cream pie. You can be served in private dining rooms large and small at Lagasse’s Warehouse District flagship. It’s one of the most historic fine dining institutions in the country, so choosing Galatoire’s will ensure your rehearsal dinner instantly becomes a classic. The second and third floors of the Bourbon Street landmark offer a variety of dining options catered by the restaurant’s resident Executive Chef – and recent “Top Chef” contestant – Michael Sichel. With its wrap-around balcony spanning the Mississippi River on one side and the lower French Quarter on the other, the Atrium Dining Room at Galvez Restaurant is considered by some as the most romantic in the city. With its Cathedral ceilings, high vaulted windows, the location is a stunning setting to enjoy the French, Spanish, Creole cuisine and celebrated tapas. For rehearsal dinners on the North Shore, the elegant Lagniappe Room at N’tinis is a natural choice. The restaurant has built a strong reputation for tasty steaks, delicious martinis and party fun. You can choose between a seated dinner, buffet or carving stations, or have a menu built around your requests. 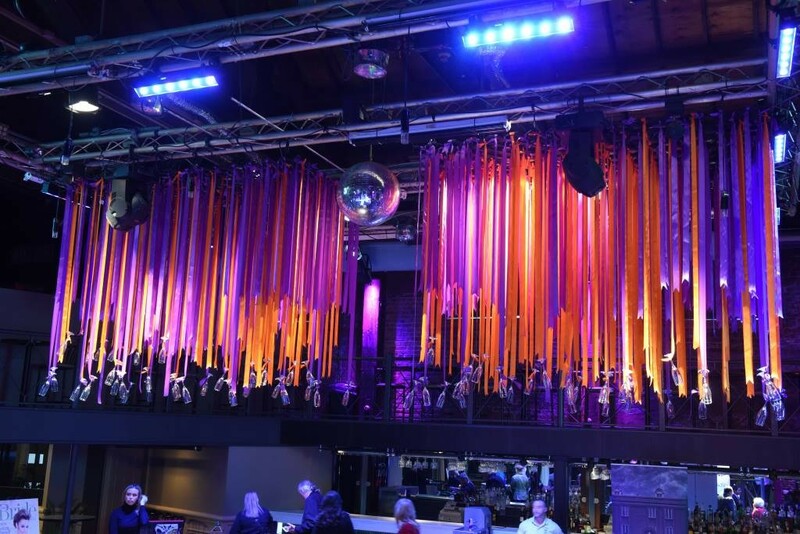 Owned by football legend and New Orleans resident Archie Manning, the super-sized sports bar located on Fulton Street is a way for football fans to incorporate their love of the sport into their wedding. The restaurant’s “Eat, Drink and Cheer” menu is full of Southern and Cajun comfort foods, perfect for your personal pep rally as well as Game Day. Dickie Brennan’s newest restaurant, Tableau, offers a new way to celebrate in the heart of the French Quarter. Situated at Jackson Square with beautiful views, there are four different private rooms offering classic French Cajun cuisine. You can’t get more Creole than Tujague’s. Located in the heart of the French Quarter with balcony access, the restaurant has been hosting rehearsal dinners since 1856. With a recent renovation and addition of a new chef, it is more inviting than ever.